Marriott International has announced that they are imminently officially breaking ground on a new Ritz Carlton at 1185 Broadway in NoMad, a trendy Manhattan neighborhood for new hotels. Marriot, the Ritz-Carlton Hotel Company, and the Flag Luxury Group are responsible for the development. 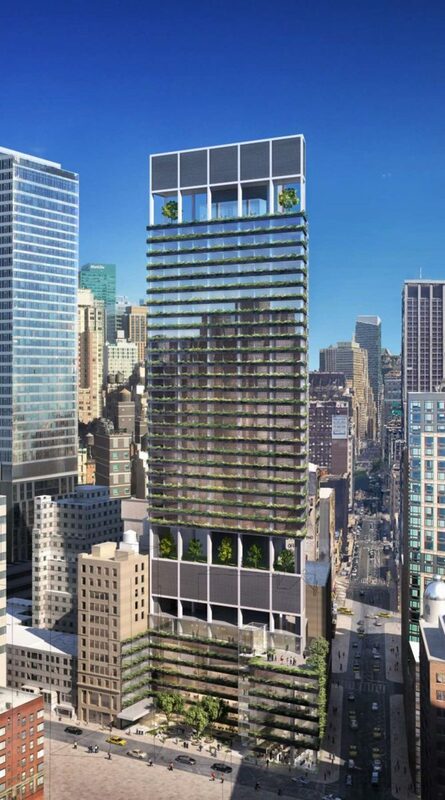 The 40-story tower will continue the densification of the area right above the Flatiron, and help address the demand for new hotel space in New York. Rafael Viñoly Architects is responsible for the design. The firm is most well known in New York for designing 432 Park Avenue, the first supertall by Central Park South to rival the Empire State Building’s prominence from afar. Yabu Pushelberg will be responsible for designing interiors. For the Ritz, the façade’s curtain wall will be separated into bands of glass and a dark grey concrete, similar in appearance to what was used for 277 Fifth Avenue. The building will feature several terraces, including two with trees. The greenery doesn’t stop there. The concrete bands will feature a small planter space. Whether this is actually achievable in Manhattan is highly questionable. The 580-foot tall structure will yield over 150,000 square feet within, create 250 guest rooms and sixteen residences. 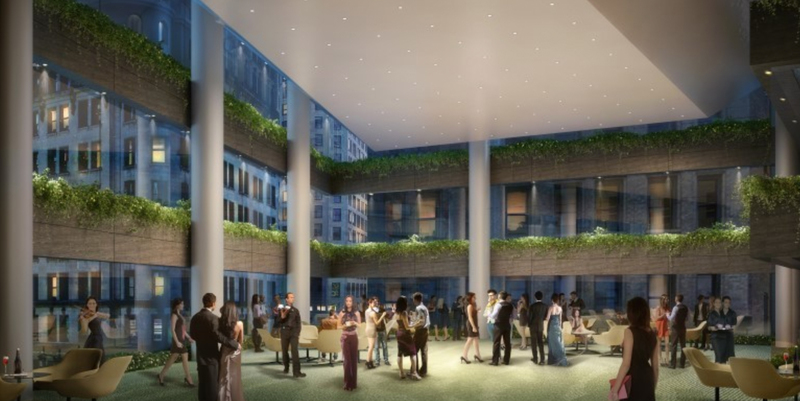 Amenities will include a branded Ritz-Carlton Spa, fitness center, bicycle parking and a rooftop bar. The ground floor will include a fine-dining restaurant with a bar, an important component for any fashionable new hotel. The development will cost an incredible half billion dollars to complete. Groundbreaking is planned for tomorrow. 9 Comments on "Viñoly-Designed Ritz Carlton Officially Set to Break Ground at 1185 Broadway in NoMad, Manhattan"
Please pardon me for using your space: No have fetter on development and design. Feature on facade you have to focus. They should keep a couple of backup trees in planters on the plaza to be lifted into place when one of those upper floor trees die. NoMad? Another stupid acronym? How many more hotels do we need in this city? The NY skyline is quickly disappearing and it’s sad. This is nice work and really works for that corner. Happy to see architecture that provides a sense of place, for once. 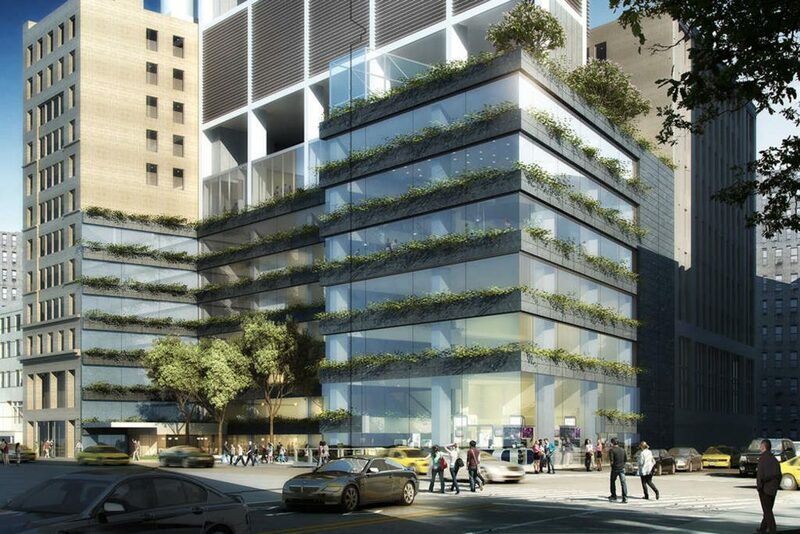 The hanging gardens of Broadway concept looks great in renderings but will certainly prove to be a maintenance nightmare and fail miserably yielding yet another glass and steel highrise luxury hotel. How does one define groundbreaking? They’ve been doing foundation work here for well over a month already. Official ceremony with big wigs etc. Good to know! lie, also the drug dealers and other criminals on 28th and broadway are not seen here they will never leave after 30 years in their spot.